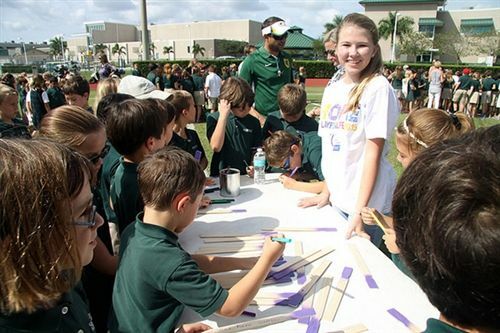 Relay For Life at Shorecrest kicked off its 11th year with a special event on campus. As part of the Relay theme of "Paint the Town Purple", students had purple paint sticks to write on, and let others know why they Relay. Students from all grade levels took part in the program on Haskell Field. Plans for a future art installation using the sticks are in the works. "A lot of planning went into the kickoff, and we truly couldn't be happier with the result. We are so excited for the start of the Relay season and hope everyone else is too!" said senior Victoria V, one of the three Leads of Shorecrest's Relay this year. It's time to get your Relay team and team members to sign up so fundraising can begin! Sign up here. Community members in St Petersburg, Florida, are invited to join Shorecrest for Relay For Life on Friday, April 8, 2016. Events will be held on the football field of Shorecrest Preparatory School from 5pm-11pm. More can be found at www.shorecrest.org/relayWatch her short video clip from the event on Instagram @shorecrestrelayforlife.